Portsmouth Sail Training Trust recognises that sailing has many benefits for promoting health and wellbeing. It enhances social and communication skills, listening and learning. 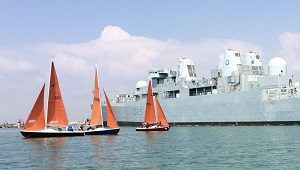 Going afloat requires physical co-ordination, quick decision making, awareness of others – and sometimes problem solving! 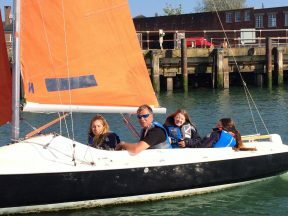 We deliver regular, ongoing sailing and maritime training for groups of pupils from Portsmouth Schools. These enable the young people to gain commercial qualifications alongside developing life skills and confidence. This programme has a positive long term impact on behaviours and achievement at school. As a school we have to think very carefully about where to spend our funds so that they impact the widest possible number of students. I’ve found that sailing with PSTT does this on all fronts and it’s something I hope continues to grow into the future. The level of expertise and patience of the instructors has made engaging the students in learning a difficult skill very easy as it has fuelled the students keenness to attend week after week. If your school is interested in finding out more about our programme please email us.